2011 has been an awesome year of running for me, a few PRs, several goals accomplished and new distances obtained. 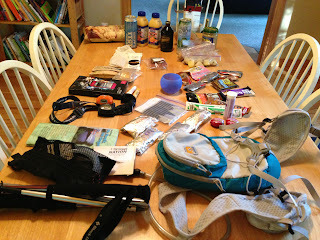 I wish I had been better about blogging about things along the way and recapping races. I know that several weeks before a race I am always searching the Internet for race reports and I savoring every word I read. 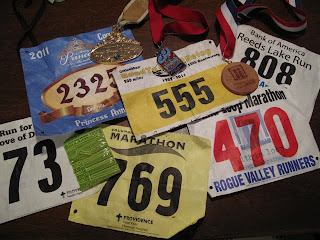 In 2012 I will be better about recapping my races. February 27 - 2:08:52 This was my annual half marathon with my dad. My step sister, step mom and sister-in-law also joined us. We had to get up at 3am for this race and I swore I would never do this again, I think the rest of the family did as well. It was difficult running in the Florida heat coming from the cold rain and snow in Oregon, but it was a lot of run running through Disney with all the other "Princesses". June 12 - 0:24:27 PR This race benefited Dove Lewis a local non-profit animal hospital, which I got to run with my favorite 4 legged running partner, Oscar. I normally don't want to pay to run a 5k, but I couldn't resist a chance to run a race with Oscar. Oscar is an ex-sled dog, I am sure that helped with the PR and accomplishing my goal of running a 5k in less than 25 minutes. June 25 - 0:26:09 and 0:56:11 A local race in Grand Rapids, MI I ran this summer with my dad and Gretchen while visiting. It was nice that the 5k and 10k were back to back, so I was able to run both of them. The 5k was first and I ran it a little bit slower than I normally would of since the 10k was after. Hood to Coast Team "Honey Buckets and Buckettes"
October 23 - 1:55:04 PR Susan and I have run this race for the last 3 years. 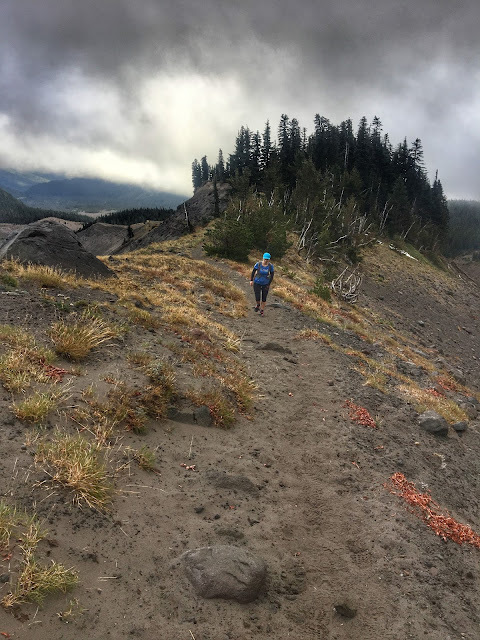 This year they changed the route, which avoided the huge hill at the beginning, we were actually a little disappointed by this since we were training for the insanely hilly Lithia Loop Marathon. Moving the start meant they had to bus everyone to the beginning, which ended up causing the race to start 30 minutes late. Luckily the weather was unseasonably warm and sunny. Eliminating the hill at the start added a new hill in the middle of the race which we did not anticipate. I could of sworn this slowed us down a lot, but somehow we ended up PRing - 1:55:04. 5:10:08 - Goal Obtained: first trail marathon Not my fastest race, but it is a close tie with Hood to Coast as the craziest and most fun. In the first 8 miles we gained almost 5000 feet of elevation. It snowed on us for 22 miles and there was already several inches of snow on the ground, which made for an interesting running experience. There were times when I could barely feel my lips or nose. The volunteers at the aid stations were awesome, every time we approached they asked what we wanted and made sure we refilled out water bottles. This was the first race where I had Sprite at an aid station, I could not get enough of it, and I never drink soda. 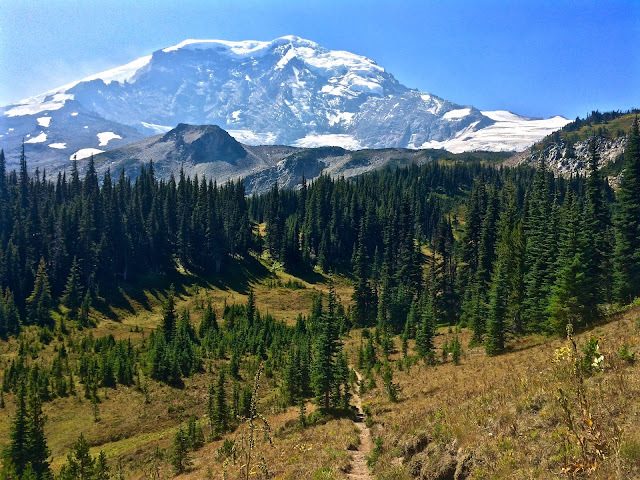 The course itself was amazingly beautiful, once again it reiterated my love of trail running. I will probably do this race again in the future. Birthday Run "Girls Gone Wildwood"
Ran all of the Wildwood trail 30.25 miles - November 27 - New distance A few months ago during one of our long runs, Susan and I had the brilliant idea of running the whole Wildwood trail for our birthdays. I am blaming this insane idea on our "runner's high". We accomplished our goal. The Wildwood trail is 30.25 miles long we added on a little extra getting to one of our DIY aid stations, we probably ended up doing ~31miles/50km. It was difficult, cold, wet, muddy but effing awesome! Susan is the best running partner.